→Why Can’t LED Bulbs Be Enclosed? LED bulbs are usually not suitable for enclosed fixtures, and the reason lies in their properties associated with heating up in closed spaces. Their structural arrangement and incompatibility with enclosed fixtures result in electrical mishaps to occur frequently. The underlying reason is their problem of building up of heat inside an enclosed fixture and leading to severe complications. The problem can also lead to the use of the entire bulb at one go and hence adds to nuisance. For reasons related to their heat accumulation properties, LED bulbs are hardly preferred for enclosed fixtures at present. Light fittings accompanied by sealed light sources are the primary structure of an enclosed fixture. Prevents adequate air flow and traps the heat inside. Lensed light fixtures, light fixtures from mason jars, porch light fixtures, recessed ceiling fixtures are some examples of uses of enclosed fixtures. Usually, poor heat depletion occurs due to the return of heat to the light source. May lead to the irregular flickering of light now and then. Gives rise to potential heating problems at times. Unsuitable for lampshades and LED light bulbs. Below are the common downsides of enclosed LED lights. These are a few of the many problems for what we never recommend using LEDs this way. Enclosed LED lights usually lead to the end of the life span of the bulbs in a short duration of time. Since enclosed fixtures are sealed sources and have less space for air to pass through or heat to escape, the problem arises. The light source which is the bulb emits heat which is unable to escape from the enclosed fixture. As a result, the heat accumulates inside and returns to the light source, i.e., the bulb. More heat returns to the LED bulb, and it overheats for quite some time leading to a wide range of mishaps to occur. The bulb might just show abnormal flickers or just explode out of the blue. This is both a waste and an inconvenience because it refers to the ineffective and useless side of buying the bulb in the first place. Thus, enclosed fixtures lead to the short-lasting life span of the LED bulbs in the end. Overheating due to enclosed fixtures can reduce the consistency of illuminating of the bulb as a long term effect. 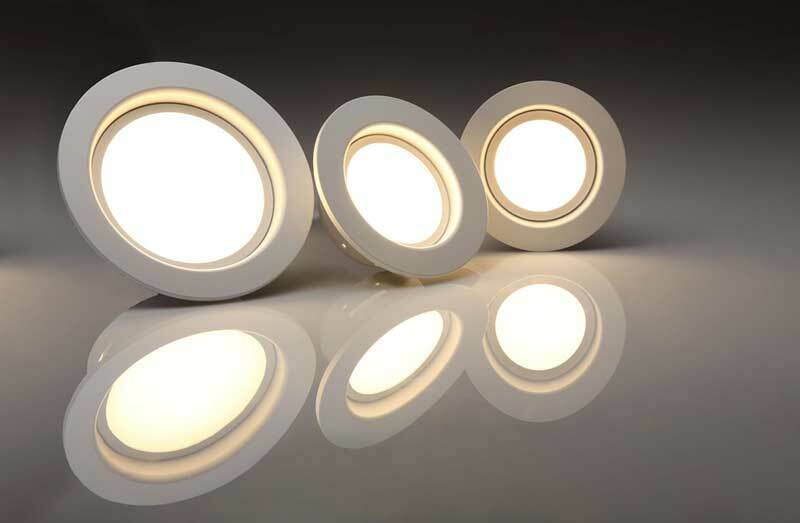 Although there are some LEDs which do not usually burn out when enclosed, it does not imply that they are effective for potential use in the long run. These LED bulbs result in diminished stability over a long time and lose their steadiness ultimately. Although they do not burn out, they produce flares constantly which are extremely disturbing to experience. Budget for regular electrical supplies like bulbs, wire connectors, circuits, tools, etc. are usually considered a one-time investment in most homes and establishments. Frequent burning out of LED bulbs or their dimming out frequently adds to the expenditure and creates inconvenience. It also results in a waste of the budget spent on the already wiped out bulbs and is extremely bothering for most people. As a result, enclosed fixtures lead to voiding on the warranty of the product which is a complete wastage of expenditure spent on the LED bulbs. Glare due to enclosed light fixtures’ emitting flickers is a serious problem. Glare refers to when a bright light source like an LED bulb, in this case, interferes with the actual vision of seeing an object. In regular circumstances, eyes adapt to the brightest level of light when such a thing occurs. During this adaption, it becomes harder to see the details in the duller or darker areas of the space even though the spaces are sufficiently kindled and lit. This leads to poor vision and eyesight problems resulting in discomfort to people. Frequent dimming of light and flickering of enclosed LED bulbs causes this problem. The best alternative to enclosed LED bulb fixtures is undoubtedly compact fluorescent lamps (CFL) or old-fashioned incandescent bulb which is frequently chosen for use nowadays. They vary to a much moderate range compared to LED ones. Although most LEDs are not omnidirectional, this difference led to the wide use of compact fluorescent lamps. The compact fluorescent lamps can produce bright light which spreads evenly in all directions making them widely used for omnidirectional purposes. They also serve as a better substitute in those spaces where enclosed LED bulbs are completely non-functioning. These fluorescent lamps even cost less than LED ones, and the pros are undoubtedly worth it. Thus, if you require something that functions the same but is not short lasting like enclosed fixtures, the suggestion would be to always choose compact fluorescent lamps. Make sure not to touch the flickering light bulb as the heat trapped inside will make the surface extremely hot and may result in slight burns. If you need to hold it, then always wrap a safety cloth around it before holding it for use. Risks associated with fused bulbs can be a major consequence in using enclosed fixtures. So precaution must be taken beforehand while setting enclosed fixture LED bulbs at home. Use LED bulbs only as per directions. Most bulbs have a sign written on them saying “NOT for enclosed fixtures” which implies that the consequences can be grave if instructions are not followed correctly. So it always better to avoid LED bulbs to be used for enclosed fixtures to prevent mishaps from occurring. While wrapping it up, it can be said that due to abnormal heating properties, it is always considered inappropriate to use LED bulbs in enclosed fixtures. To get rid of this problem, compact fluorescent lamps can always be used as alternatives, and LED bulbs can be used without adopting enclosed fixtures. If necessary precautions and instructions are followed, it will always be possible to prevent mishaps from flickering bulbs and to save the bulbs from drying out pretty much sooner than their lives.